Check out my writing portfolio and chat for a while about movies, cooking, or anything else you'd like. SPOILER ALERT: I will discuss elements of the film's plot and characters, so some spoilers are bound to ensue. I encourage you to watch the film before reading this review. This is one film that everyone should see at least once in their lifetime. Twelve men in a stuffy jury room deliberating for nearly the entire runtime of a film - doesn't sound like the setup for one of the greatest films ever made, does it? But therein lies the genius of 12 Angry Men and the creators behind it - writer Reginald Rose, actor/producer Henry Fonda and director Sidney Lumet. Because, from those seemingly simple pieces, they do indeed form what must be considered one of the greatest movies to ever grace the screen. At the outset of the film, we are given important cues that will impact the rest of what we see. The camera moves through a courthouse until we make our way into a back courtroom. There, a disinterested judge (Rudy Bond - uncredited) is giving directions to a jury before they go into deliberations in a murder trial. This case is such a sure thing that the judge is simply going through the motions. Then, as the jury retires, we get the only shot of the defendant (John Savoca - uncredited) we will see in the entire film. We gather that he is young and that he is a minority, though his exact ethnicity is somewhat indefinable. He looks scared and sad. His life is in the hands of others now. The judge has explained that the death sentence is mandatory in the event of a guilty verdict. With that, we follow the jurors to their small, stuffy jury room. For nearly the entire remainder of the film, we will find ourselves with them in this jury room as they decide the young man's fate. One of the powerful choices in this film is that we do not learn the names of any of the jurors, at least not until the very end. We only know them by their juror numbers. If you've ever sat on a jury before, you know this is realistic. You don't know these other people with whom you have been given the task of deciding the fate of another. But, together, you must come to a consensus. The genius of this film is how prescient the arguments are and how resonant they still sound today. The arguments put forth in this film are the exact same arguments we are having today. Surely, they are arguments that have occurred throughout human history. Arguments about the nature of the people around us. Arguments that are obfuscated by prejudice and ignorance. Right away, we begin to learn how some in the room feel about the defendant. Even in initial moments of small talk, some of the jurors share some revealing thoughts. Then, they are all brought together for the first vote. Eleven for guilty, and only one for not guilty. "There's always one," remarks Juror no. 10 (Ed Begley). That one is Juror no. 8 (Henry Fonda). He, too, was convinced by some of the prosecution's legal arguments. However, he thinks that, since a man's life is at stake, the case at least deserves some more discussion. And there is enough reasonable doubt for him to render a not guilty verdict. Reasonable doubt, justice, a jury of our peers - these are the foundations of our court system. 12 Angry Men is a film that sets out to showcase the beauty and simultaneous faults of that venerated system. The opening shot of the film is of the monstrous exterior of this courthouse. The remainder of the film shows how such a large system is built upon small interactions. Often, it is built upon the smallest of interactions - those we have within our own minds. Each juror is given the chance to explain to Juror no. 8 why they believe the defendant is guilty. Some focus on the facts of the case. Others focus on their personal feelings about the defendant due to his upbringing in a poor, crime-filled neighborhood and his ethnicity. We begin to realize one of the hard truths of our justice system - it is nearly impossible to find a jury of one's peers. As a courtroom drama, 12 Angry Men works on every level. But it reaches transcendence, in my opinion, for its ability to go even deeper into human nature. It shows how we carry our past pains with us and how they can influence our feelings toward others. It shows how prejudice and ignorance can cloud judgment and sneakily sway minds. At the beginning, many of the jurors see the defendant as something less than human. Some see him as a mathematical equation - piecing together parts of the case to render the guilty verdict. Others see him for his skin color and socioeconomic status alone. One juror sees an impediment to his ability to get to a baseball game on time. Only one juror sees him as another human being. That's not to say that it would be impossible to render a guilty verdict. But, before doing so, one must acknowledge the presence of a fellow human being and decide whether or not the complete absence of reasonable doubt about his guilt exists. But there is yet another level to 12 Angry Men, and that is its technical achievement. This short video from Screenprism does a fantastic job of explaining how camera angle and postition helps add to the growing tension in the film. It also adds to this sense that we think we have all these people sized up at the beginning of the film and the case seems open and shut. But as the film continues, we realize that things aren't all as they seem. The camera itself supports this progression through its level and through lens changes. Sidney Lumet is considered one of the greatest directors of all-time, and for good reason. It is simply astounding that this was his first feature film. He would go on to direct such critically-acclaimed classics as Dog Day Afternoon, Serpico, The Verdict and Network. It is a travesty that he never won an individual Academy Award, though he did receive an honorary Oscar for lifetime achievement in 2005. Still, his films were nominated for 46 Academy Awards (including three nominations for 12 Angry Men) and they won six (four for Network, 1 for Dog Day Afternoon and 1 for Murder on the Orient Express). 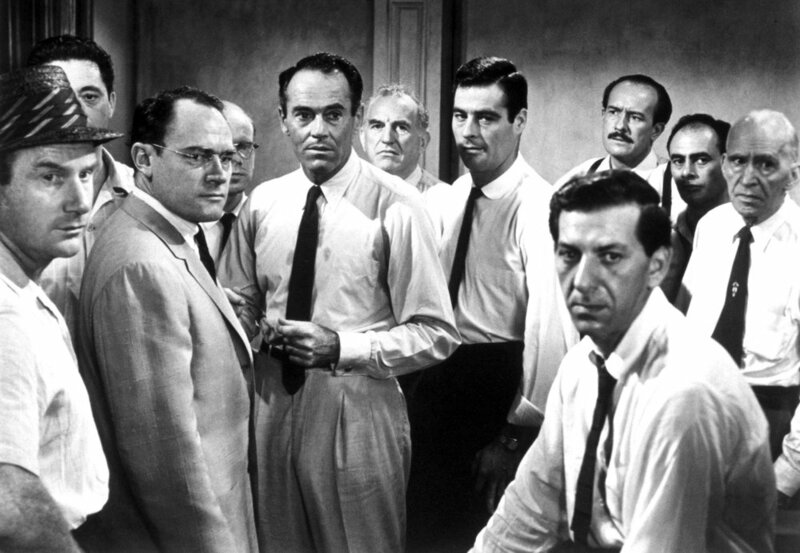 I go back and forth between 12 Angry Men and Network as my favorite of Lumet's films. They are both incredible in their own ways. In any case, it is clear that as we watch 12 Angry Men, we are watching the beginning of one of the greatest careers in film history. I do not want to spoil the film, though I'm not sure it really counts as a spoiler for a film that was released in 1957. Still, there is one scene, in particular, that is incredibly moving each time I watch the film. Of the many powerful themes in this film, standing firm on the principle that every human life has worth may be the greatest. The unraveling of the case proceeds with the pace of a thriller, and deciphering the various legal points pulls the viewer in. Again, the camera aids in this as we get more close-ups of the various jurors and a sense of claustrophobia begins to appear. Finally, a verdict is rendered. One of my favorite choices in the film is the way it ends - with a quaint, human interaction on the courthouse steps. We've been cooped up in this room the whole time, and now the camera takes us outside. The world is expanded once more, and we realize that humanity is still a beautiful thing - even for all the pain and sadness we can cause one another. We're allowed to breathe and consider what we've seen. The more we consider, the more we realize the incredible depths to the experience we've just had. 12 Angry Men is without a doubt one of the finest films ever made, and it is a film I will continue to cherish for the rest of my life. Note on content: This film is rated PG. There is some discussion of violence as the jurors deliberate this murder case. But that is about it as far as mature content goes. There is very little profanity, and there is no sexual content at all. Again, almost the entire film takes place in the jury room. As always, it is obviously up to you to decide content choices for you and your family. Some of the discussion of the case may not be appropriate for younger viewers, but this is one classic film that most viewers should find appropriate.